Free Fiction Thursday – Love Stinks, Inc.
Dyte glared at the black cat perched on the center of her desk. It couldn’t stare back at her since it was just one of the many wildly successful plush toys her company produced, but that didn’t stop her from hating its adorable little guts. The cat held a puffy red heart in its front paws. The universal Don’t Do This symbol, a circle with a slash through the center, was printed on the red satin fabric along with the stylized logo for Dyte’s company—Love Stinks, Inc. The plush cat was part of this year’s line of stuffed animals meant to appeal to chronically unattached women (and chronically unattached men confident enough in their masculinity to buy themselves a stuffed toy). Given her company’s more than healthy bottom line, the world contained about a bazillion single people who didn’t mind dishing out $9.95 for a fuzzy toy to cuddle with on Valentine’s Day just to make themselves feel better about being alone. Just like Dyte was alone. She leaned forward, planted her elbows on the smooth surface of her desk, and rested her chin in her hands so she could gaze at the cat at something approximating its eye level. She should be happy the toys were so successful. A significant amount of her company’s research and development budget had gone into determining a perfect size for the plush toys (big enough to cuddle but not so big they would give a real cat or dog or skunk a run for its money), the length and thickness of their fake black fur (somewhere between shorthair and Persian, when measured in feline terms), and the color of their over-sized eyes (a washed out blue somewhat darker than the noontime sky uncluttered by clouds but not as deep as the clear blue of a high mountain lake). That still didn’t the ridiculous popularity of the things. Even the skunks. At least the toys weren’t spelled. She’d put her foot down (metaphorically speaking) at the mere suggestion, even though both R & D and her sales department had lobbied long and hard for inclusion of a compulsion spell—a “minor” one, they had assured her—in the stuffing inside the red satin heart all the plush toys held. As far as she was concerned, customers would either buy her company’s products because they wanted to, or they wouldn’t. The last thing she wanted to do was compel people to fall in love with a stuffed toy. Compelling people to fall in love was her dad’s thing, not hers. It was hard enough to be taken seriously in business when you were the immortal daughter of Cupid and Psyche, and you had a ridiculous name like Dyte because your mom thought it would be a nice tribute to name you after your grandmother. Like Aphrodite had ever given one whit about her granddaughter. Which was fine with Dyte. From the stories she’d heard, grandmother had a vindictive streak a mile wide, just like a lot of the old gods in the family tree. Even though Dyte was an immortal like her parents, she was glad to stay off grandmother’s radar. If only she’d managed to keep her private life off her dad’s radar. This story is no longer available to read for free, but it can be purchased at Amazon, Kobo, Smashwords, iTunes, and Barnes & Noble. 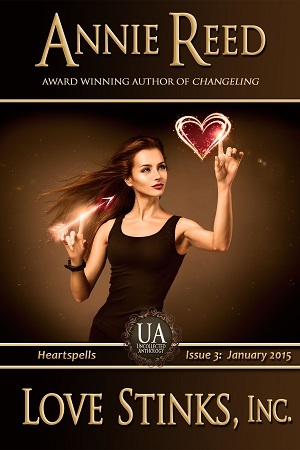 This entry was posted in Uncategorized and tagged Anti-Valentine's Day, contemporary fantasy, fiction, free, holiday, romance, Uncollected Anthology, urban fantasy, Valentine's Day by Annie Reed. Bookmark the permalink.